What had happened that had made me so furious? Surely someone has cheated me of all my hard-earned wealth or caused me some grievous harm. Or at least caused me some physical injury. Well, not exactly. Some money had been lost – a princely sum of Rs.10. All this fire and fury for mere ten bucks. And no! This was not back in 40s or 50s where whole of the family’s monthly provisions could be got for 10 Rs. No. This was in the 2000s where you would be lucky to get a large cup of coffee for this amount. And for this so much anger? I reflected later through the day. Ok. But how did I lose the 10 bucks. Nothing exotic. One of the usual auto fellows. Some monkey business with the meter. Ended up taking 50 bucks instead of the 37 bucks I owed him and the 40 bucks I was willing to pay him. Now, isn’t this a regular occurrence? It is. But the series of events that day somehow caused so much anger. Come to think of it if the auto fellow had bargained with me before I got on and insisted on additional ten bucks, I might even have agreed. But seeing 37 on the meter and then some sleight of hand causing 37 to change into 48 right in front of my eyes was too much for me. I felt so helpless being cheated and knowing I am being cheated and being able to do nothing about it. When I thought about it, I realized it was this feeling of being made to feel helpless that triggered anger than the loss itself. I thought further on the topic and I began to wonder if there was a connection between helplessness and anger. That was how I began to develop what I christened the philosophy of control or the lack of it. I thought over various situations when I got angry. In school, being bullied by someone physically stronger with no natural course of resistance. In office, being told to do things I did not want to by persons in power with no opportunity to refuse. Parental control. As I was thinking of these situations, my mind began to visualize water flowing from a tap. What happens when you try to block the tap with your fingers? Water spurts and bursts forth in all directions and splashes you or someone nearby. It does not have the cool composed power of a free-flowing waterfall. But wild and uncontrolled, it gushes out in all directions it can, in resistance to the power. Such I imagined is the working of anger. Anger is like that water, lashing out in whichever direction it can in resistance to any attempt to control the free flow of one's desires. As managers in corporate world like to say, I have come up with problem. But where is the solution? Again, let us get back to the tap. How do you stop the water spurting aimlessly in all directions and wasting away? Either turn on the tap to such great force that will sweep away the fingers trying to block it. Or slow down and trickle through the gaps in the fingers. If there are no gaps, totally withdraw within and cease to flow. In human terms, the first is the way of the hero; the second the way of the saint. Either become so strong that no one can ever control you. Or give up resistance totally. The way of the hero is to build strength and get past all obstacles and be fully in control and have things as per one's desires. This is a never-ending journey. For however strong you become, there is going to be one stronger than you. Unless you become the strongest person in the universe. And still you have to constantly remain the strongest. Life will be a never-ending tussle, an arm wrestling match. The way of the saint is to totally give up resistance. Just give up desire and flow along the past of least resistance. When you don't have any specific direction in which you desire to flow or even to flow at all, who can control you? Thus is the fatalistic philosophy of Epicures. Or the more proactive philosophy of the Gita, that categorically declares "Action alone is yours, never the fruits thereof". 'Swami Vivekananda' was an epitome of this philosophy. Nothing could perturb him. When a bull was charging at him, he stood calmly waiting, calculating the distance he would be tossed by the impact of the bull's horns. He displays this "I don't give a damn come what may" attitude on many occasions in his life. 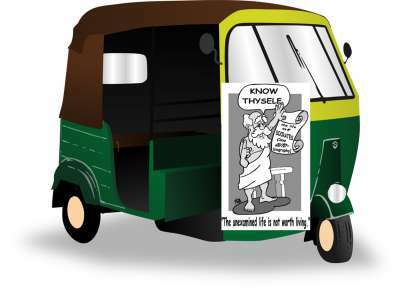 Thus an auto ride got me into philosophical rumination while he who drove the auto coolly got away with an extra tenner. I hope he enjoyed the tea, coffee, cigarette or paan whatever he got with the extra ten bucks.